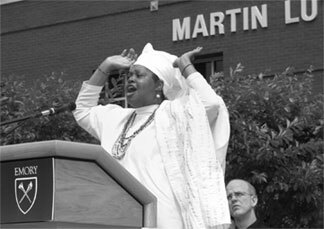 Lynching photo exhibit opens with tributes: Priestess Iyalosa Omolewa Eniolorunopa of the Ile Ori Ifa Cultural Center delivers the invocation at the May 1 opening ceremony for Without Sanctuary: Lynching Photography in America, on display through the end of the year at the Martin Luther King Jr. National Historic Site. The exhibit, of which Emory is a copresenter, consists of images from the collection of James Allen (seated behind Omolewa). The priestess performed a ceremonial pouring of libations at the event, held in the Historic Sites rose garden.Click here or above for the full story. Photo by Jon Rou. 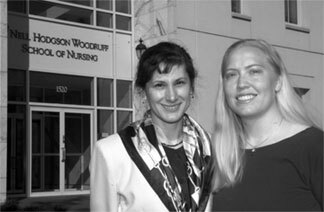 Laura Wagner (right) earned a $100,000 grant from the John A. Hartford Foundations Building Academic Geriatric Nursing Capacity Scholar Program to support her doctoral studies in geriatric nursing in the Nell Hodgson Woodruff School of Nursing. Last fall, Wagner began studying with Associate Professor Elizabeth Capezuti (left). Within a short time [Laura] began coordinating projects and was an excellent supervisor for the other student research assistants, Capezuti says. Photo by Kay Hinton.